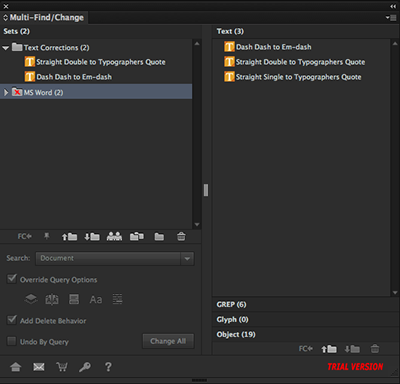 Multi-Find/Change (MFC) is an Extension for Adobe InDesign and InCopy CS6, CC, CC 2014 & CC 2015 to manage and execute batches of saved Find/Change queries. MFC is the ideal tool for those who rely on Find/Change queries to correct and/or format text. What's New in MFC 2.0? MFC panel is now a native InDesign (InCopy) panel, this means it can be docked, minimized or expanded. MFC is compatible with the themes of the new InDesign (InCopy) CC interface. Perform Find/Change on Paragraph and Character Styles. If you have bought Multi-Find/Change 1.0, you are eligible to buy Multi-Find/Change 2.0 for $24.95. Copy the coupon code and paste it in the "Coupon code" field in the Multi-Find/Change 2.0 Order Form. Any problem contact support@automatication.com. • Version 2.0.5 - Resolves issues with Windows and MacOS compatibility. • Version 2.0.4 - Provides compatibility with Adobe InDesign/InCopy CC 2015 (05/11/2015). • Version 2.0.3 - Provides compatibility with Adobe InDesign/InCopy CC 2014 (30/06/2014). • Version 2.0.2 - Resolves issues related to Object queries and Change Case feature (25/04/2014). • Version 2.0.1 - CS6 compatibility (28/10/2013). • Version 2.0.0 - Initial release (09/10/2013). MFC is platform independent; the same software will run on Adobe InDesign or InCopy CS6 & CC on the Mac OS or Windows. If you try to double-click on the file, you might get the following message; “Install_MFC.command” can’t be opened because it is from an unidentified developer." 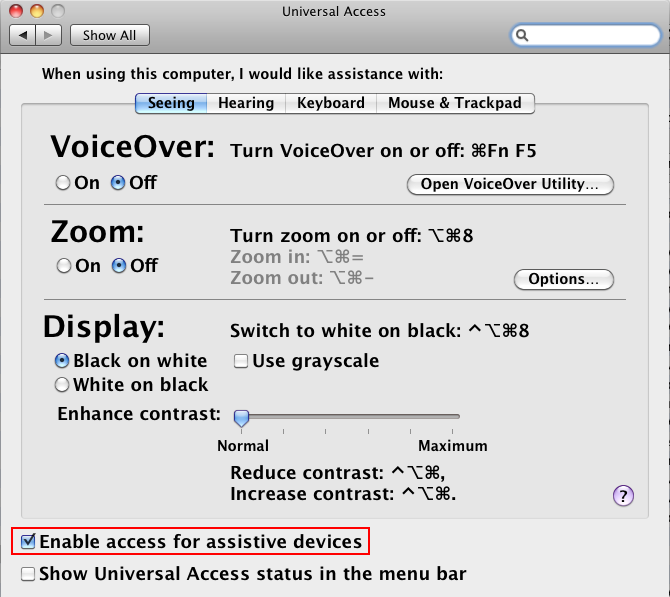 After double-clicking on Install_MFC.bat , depending on your user account privileges you might get an OS dialog asking to authorize the installation. 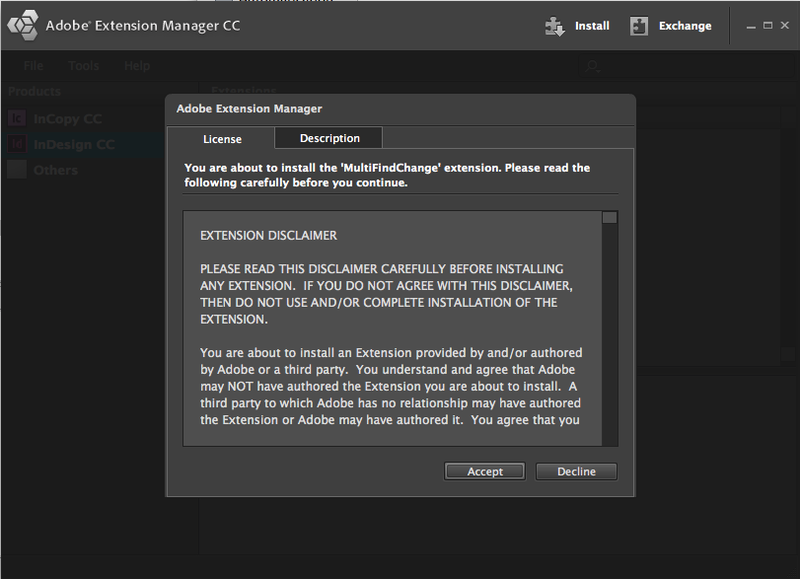 To install Mutli-Find/Change extension, you must have Adobe Extension Manager CS6 or CC installed. Adobe Extension Manager provides an easy and convenient way to install and delete extensions in Adobe applications. 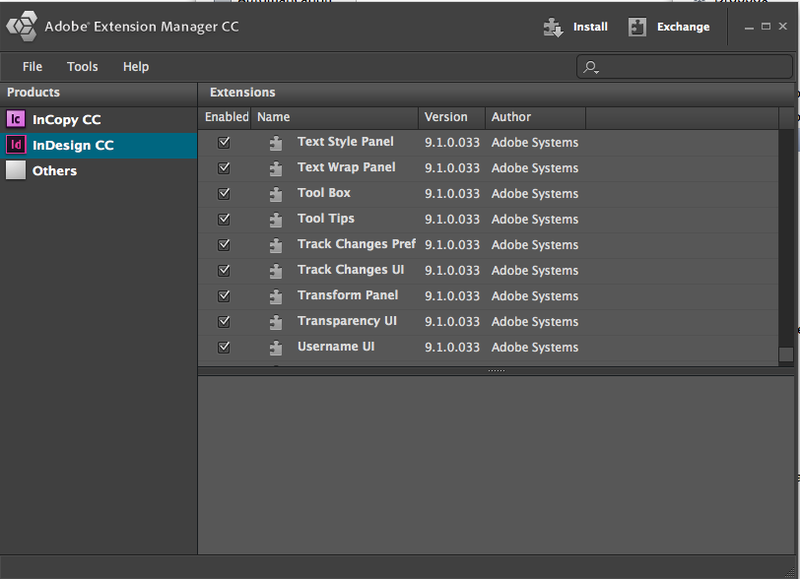 Adobe Extension Manager CS6 and CC can be downloaded from Adobe Creative Cloud. if you have older versions of Adobe InDesign (or InCopy) installed, you will probably also have older version of Adobe Extension Manager, so make sure that you open the correct version (CS6 or CC). • Double-click MultiFindChange2.zxp (inside Folder MultiFindChange2) file in Windows® Explorer (Windows) or in the Finder (Mac OS). • Multi-Find/Change extension should appear immediately in the extension list. 1 - Quit Adobe InDesign (or InCopy). 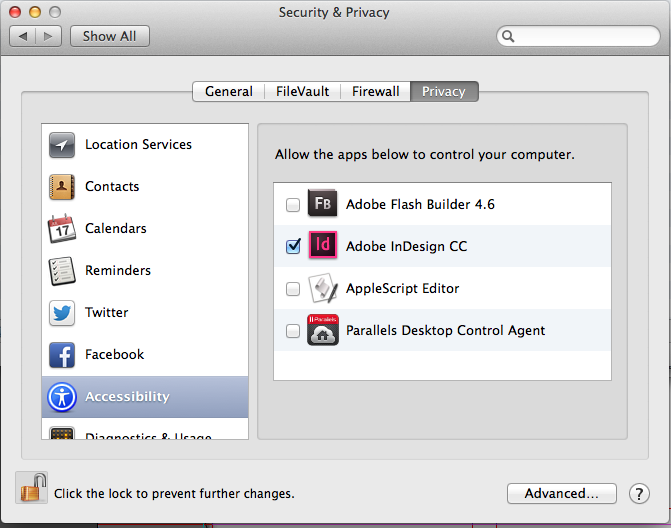 2 - Navigate to the folder where Adobe InDesign is installed. 3 - In the InDesign folder, there should be a folder named "Scripts". 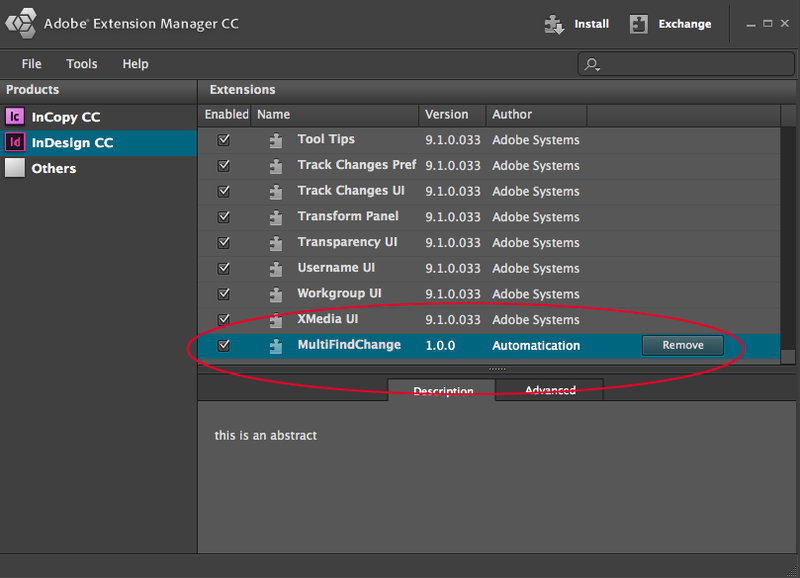 4 - Locate the folder named "MultiFindChange" and moved it outside Adobe InDesign (or InCopy) folder or delete it. 5 - Restart Adobe InDesign (or InCopy). 1 - Each time the Multi-Find/Change panel is re-opened, it will take a few seconds reload. The workaround is to minimize the panel rather than closing it. 2 - Straight after opening the Multi-Find/Change panel, the first keyboard shortcut doesn't seem to go through.